Description: Inspired by hacks such as Invictus, Kaizo no Yume is an Intermediate vanilla/chocolate swirl hack with a relatively steep difficulty curve. 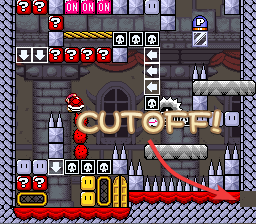 -A "Learn 2 Kaizo"-esque mini-hack in the opening level called Kaizo University. This features a hack tutorial as well as various sections to practice ASM and basic kaizo tricks. Improve your skills or learn something new! Please DM me on Discord or PM me if you find any issues I may have missed. Oh, it's so really fun~! I'll just say that the tricks with throw blocks are kinda annoying. I noticed a bug in cosmos shells level. If you press pause while going up from a shell, you get a lot more height. You could possibly exploit that in some spots. Had a lot of fun. Amazing hack ! This hack was really fun, the speaker box in birdos castle had me nervous for a second when it told you if your fingers get sore to take a break lol, but the motor skills weren't as rough as I thought it would be (my thumbs allowed me to type this) GG Duders! Really like this hack; in the same vein as Invictus as far as difficulty & aesthetics. There were some parts that were a *little* too "tight" and became unfun, but overall was enjoyable. A++ 5/5 would play again. Thanks for the feedback guys, it's extremely helpful. Some of the issues you guys have stated I'm looking for a fix and will update as soon as I find it! Loving this hack right now. Awesome art style, really fun overworld. I'm actually excited to find the secrets and I don't find the levels overly difficult. Great work! The levels where Mario moves right automatically are super frustrating because he also jumps automatically if you keep holding a jump button for a regrab for example. I found the springs level very frustrating because most jumps where completely or almost blind. There was also an instance of a level breaking in the spring level, one of the grinders that follow you kept spawning inside the munchers making it impossible to use it, another instance of a level breaking was in Sakura tree, where the grey falling platform depicted in screenshot 8 kept not spawning for some reason, both of these problems fixed themselves when I reset the game. the throwblock level. The throwblock shooter mechanic feels super janky and I randomly sometimes get a left throwblock throw + it feels very awkward. Hope that you fix the shooter.